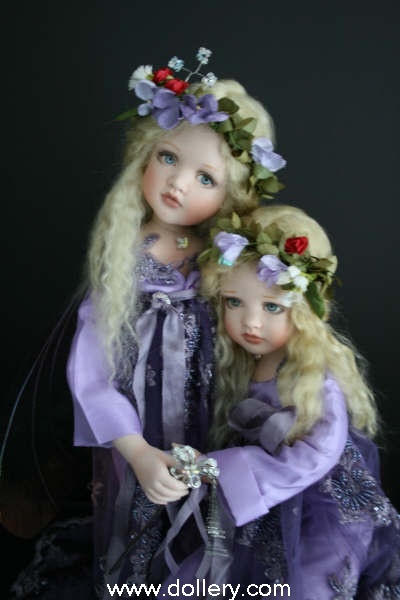 Porcelain BJD's- sorry, no custom orders now for porcelains. WE DO HAVE SOME PORCELAINS AVAILABLE NOW ON OUR 2ND MARKET SECTION - BE SURE TO GO TO THE SECONDARY MARKET SECTION FOR LORELLA'S WORK TO VIEW AVAILABILITY. Lorella on a personal note, is also an absolute sweet heart! Be sure to get on our mailing list for Lorella's work and contact kmalone@dollery.com to discuss custom orders similar but not exact of course to others she has done in the past. Contact us also for a free color catalogue featuring her work among many others with a more detailed bio on her. 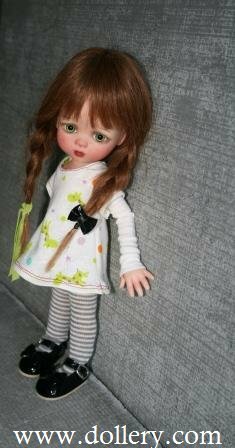 SECONDARY MARKET - Looking for a sold out doll? Check our 2nd market page - click on yellow box to the left! Looking to sell? Contact kmalone@dollery.com for our 2nd market information sheet. Resin ball jointed doll, approx. 10 inches tall, real hair, brown glass eyes. Juniper wears an adorable outfit which consists of retro polka dot bloomers and a sweet cotton dress with pockets, perfect for her to put all her favorite little things in. Her coordinating knit jacket can be worn separately or with both pieces. Her outfit is completed with socks and two tone sandals. Juniper carries a pacifier on a beaded necklace and wears a sweet little lamb hat. The little lamb is not included. She is $850.00 plus exact ship at time of shipping. Estimated delivery December earliest subject to delivery by manufacturer. A deposit of ½ down is required to reserve her and we have a very small amount available so be sure to hurry to get your order in now. Balance due when ready to ship or you can set up an extended layaway. Juniper is shown here above with another doll to show you her scale. THIS OTHER DOLL IS NOT INCLUDED WITH JUNIPER. Isamara $995 SOLD OUT - BUT CONTACT US BECAUSE WE HAVE ONE AVAILABLE THRU THE 2ND MARKET. 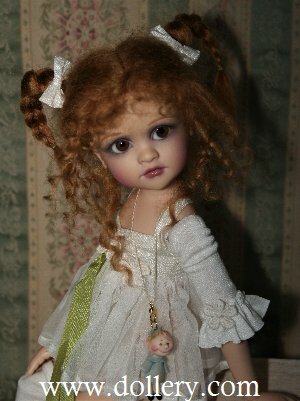 LE 50, Resin Ball Jointed doll,18 points of articulation,15 inches, German mouth blown violet glass eyes, real hair. Isamara is dressed in an adorable cream color silk and silk chiffon dress with a double ruffle, trimmed in genuine violet leather bow and silk ribbons. Her undergarments are silk, her fishnet lace stocking are embellished with a small flower and she has fishnet arm warmers, her outfit is complimented with pearl leatherette shoes with a brass buckle. Taking orders now! Sold out nationally but we still have a couple left to order thru our gallery! 1/2 down, balance due in June (estimated ship date) when in. Reserve your beautiful "Saffron" now! Don't wait! $995.00 - EMAIL KMALONE@DOLLERY.COM NOW TO ORDER! 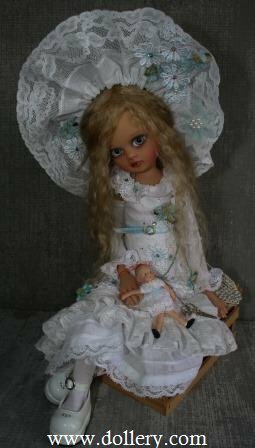 One of aThis One of a kind version of "Lady Bird" was custom made for Dollery - (Lady Bird sculpt) - SOLD - get on our mailing list for automatic notification of other one of a kind costumed dolls. Love this face? We still have "Lady Bird" available as an edition - see below. 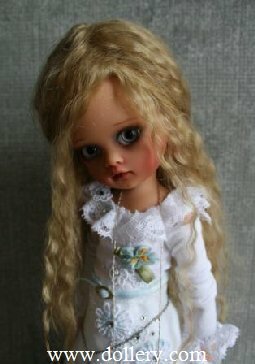 Resin, double jointed ball jointed doll, 13 1/2" (34cm), Blond human hair, Mouth blown German glass eyes. She will be arriving in October or November 2016. Hurry if interested as she is a definite winner. 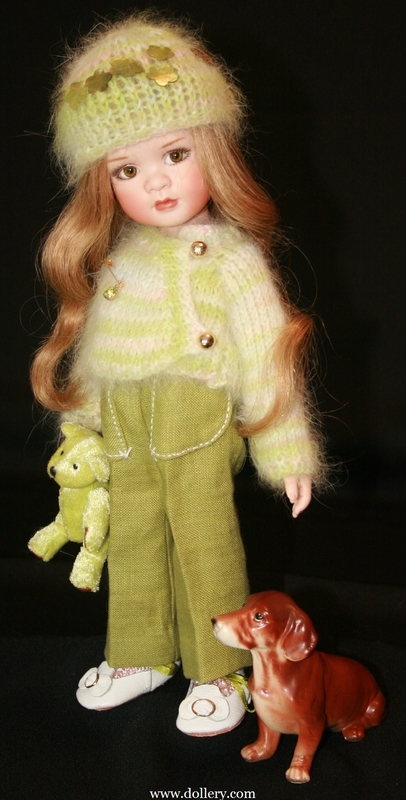 LE/50, Resin Ball Jointed doll, approx. 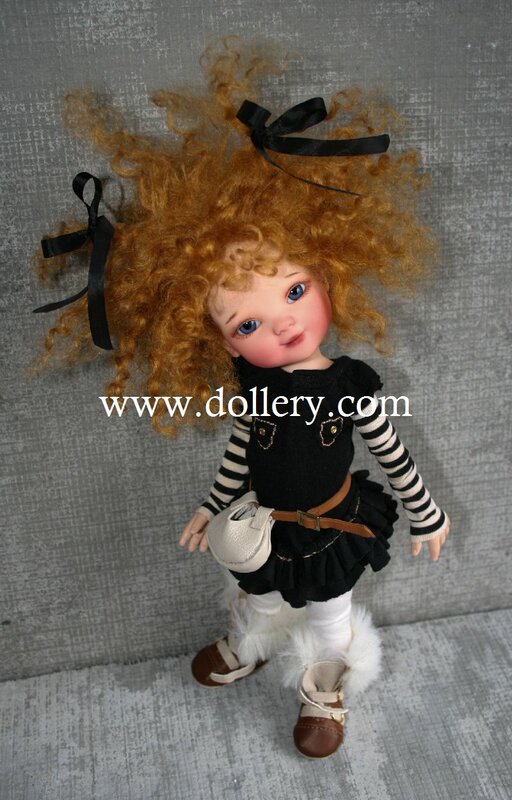 10.5 inches, 18 points of articulation, double jointed, mohair wig, German mouth blown eyes. Her name is Lady Bird, named after one of the former First Ladies of the United States of America. With the election happening this year it seemed so appropriate. During infancy Lady Bird Johnson’s nurse commented that she was as pretty as a “Lady Bird.” This adorable nickname virtually replaced her real name for the rest of her life, opinions differ whether the name refers to an actual bird, or a ladybird beetle. A perfect companion for Starling and Sparrow. Lady Bird wears a white cotton blouse and a pleated black linen skirt, striped leggings, arm warmers and adorable lace up boots that can be worn with the collar up or down. 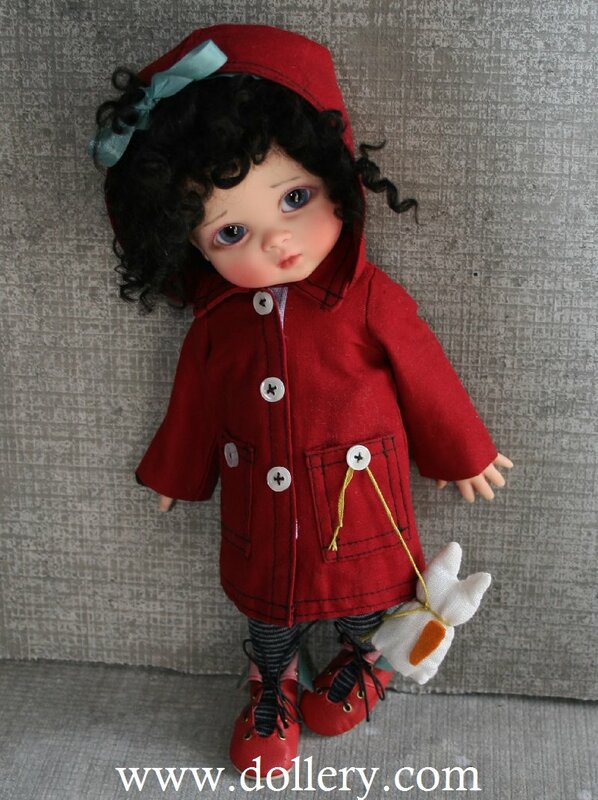 Her outfit is completed by an adorable red coat with a removable hood, black stitching and white buttons. She’s all ready for her first day of JK with her back pack and toy bunny. She’s not sure she wants to go. Amazing attention to the tiniest details!! Celebrating the beginning of Spring and all the new things it brings. 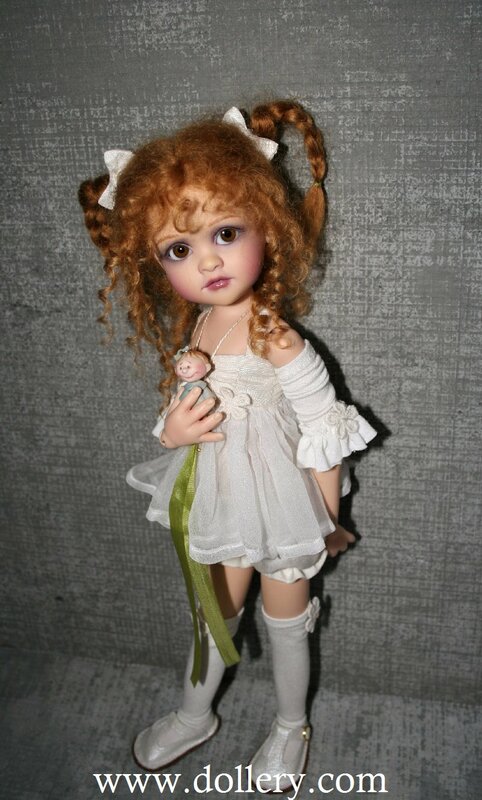 Resin Ball Jointed Doll, double jointed, ivory skin tone. German mouth blown glass eyes, human hair, body blushing, hand painted by the artist. The costume is made from vintage fabrics. She is dressed in a cotton batiste dress, the top is made of lace which has been beaded with pearls and embellished with antique silk flowers and ribbons. Cotton under garments, tulle arm warmers, cotton leggings, and patent leather platform Mary Jane shoes. Her head is adorned with a hat made of crocheted lace and flowers. 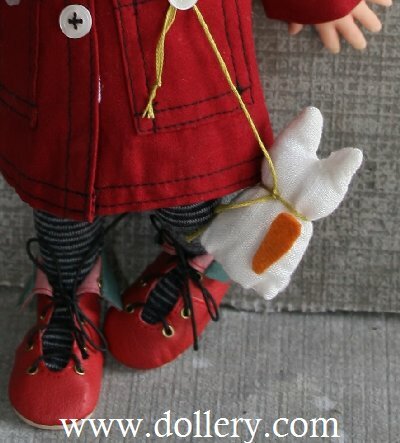 Her outfit is completed by a satchel that holds a felt bunny made by the artist. Overalls, T-shirt dress, leggings, arm warmers and coat. She wears pleated overalls made of fine linen, they can be worn alone or under the t-shirt dress. The adorable print t-shirt dress can be worn by itself with the striped leggings if one chooses. The arm warmers can be used with both outfits. The beautiful linen coat has black stitching and buttons, the hood is removable. Her shoes are made of patent leather embellished with a bow and she carried a cloth bag. Sparrow wears a bow in her hair and has adorable glasses. She’s so tweet! 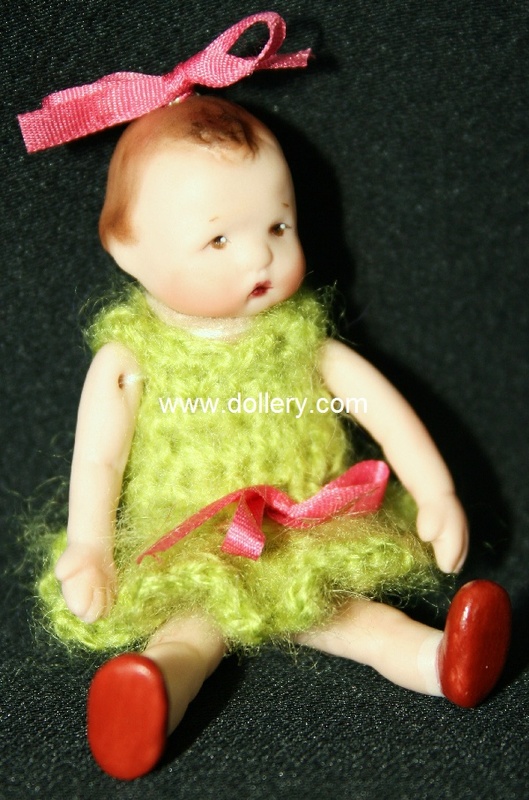 She is $895.00 and you have your choice to get her WITH OR WITHOUT FRECKLES! BOTH SOLD OUT - CONTACT KMALONE@DOLLERY.COM FOR US TO FIND THEM AVAILABLE ON THE 2ND MARKET FOR YOU. 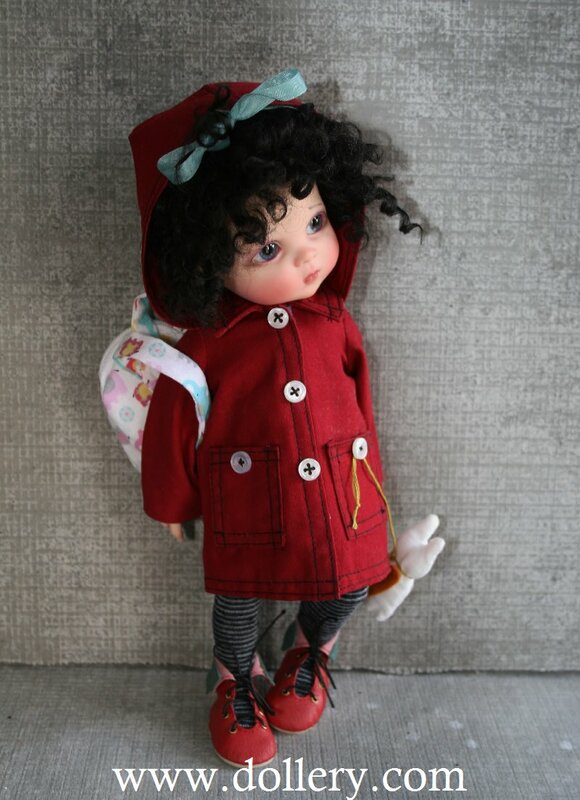 Starling is a charming 12 inch, ball-jointed doll (BJD) by Italian doll artist Lorella Falconi and inspired by kindergarten children. Lorella designs all aspects of her creations, from their beautiful sculpting to their perfectly scaled clothing. Created from resin, Starling's is fully articulated and double-jointed for fun and expressive posing. 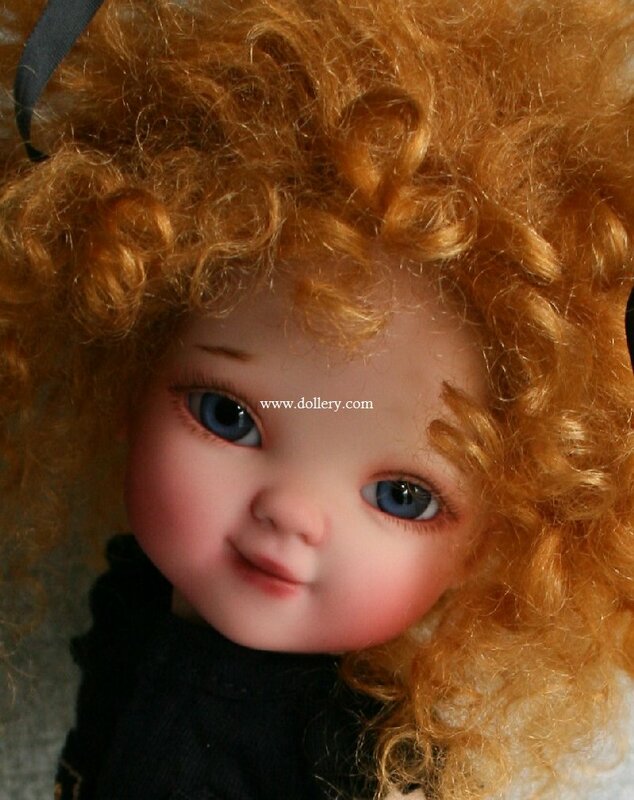 Her original artist face-up and captivating mouth-blown, German glass eyes are framed by an carrot red mohair wig with silk ribbons. Lorella designed a darling ensemble especially for Starling. She wears a short black dress with a gathered skirt, leggings, striped arm warmers and a blue coat with a hood. Her adorable leatherette boots are lined with faux fur and are embellished with straps and buckles. She carries a leatherette purse that can also be worn as a fanny pack, an adorable button bracelet completes the outfit. Lorella designs her dolls to stand on their own, but a stand is recommended. Please Note: Scooter seen in photo is not for sale. Scooter not included. This is just a prop. scene. So many posing possibilities! 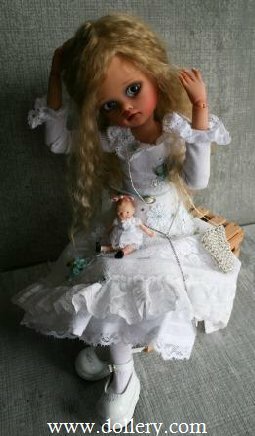 Ooak Resin BJD, approx 15", sun kissed resin, grey glass eyes, handmade angora wig, body blushing. Organdy dress with inserted lace, embellished with silk flowers, appliqué lace and Swarovski crystals. Cotton underskirt, leggings, arm warmers and platform shoes. Her hat is embellished with silk ribbons, flowers and crystals. She wears a chatelaine with miniature scissors. 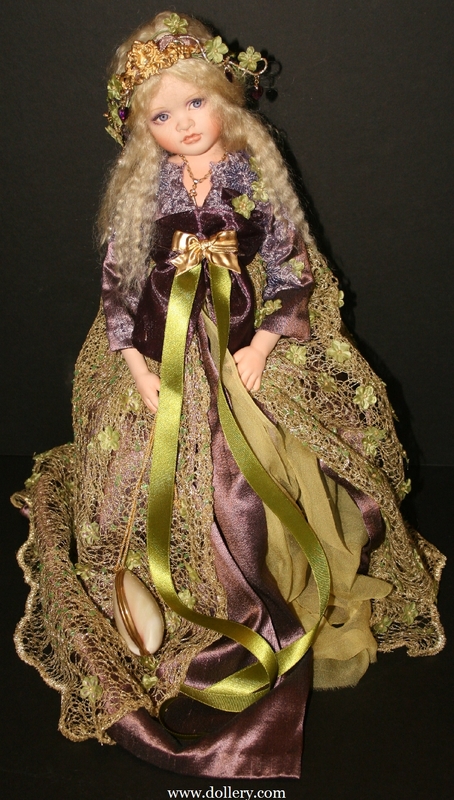 Jewels carries a resin doll dressed in lace and a crocheted purse. She sits on a carrying case that hold her accessories. She wears a costume made from a vintage wedding dress and Christening gown. 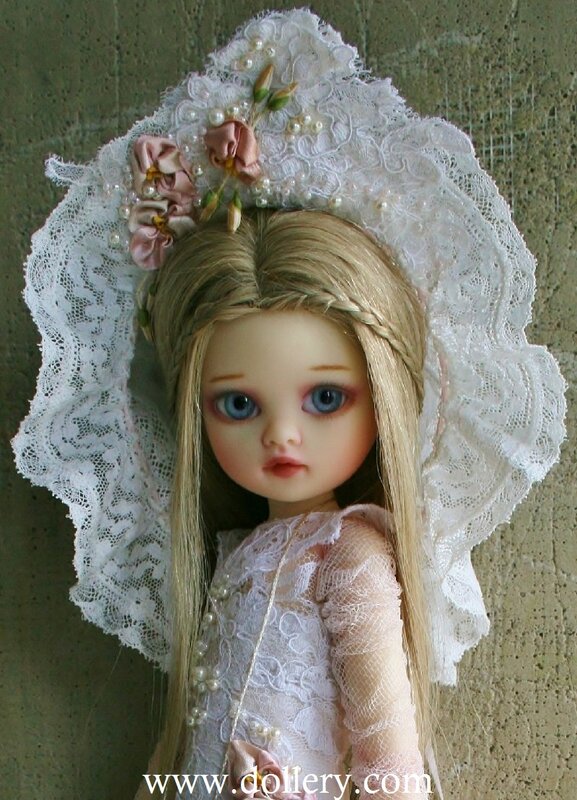 Ivory resin bjd, approx. 15", mouth blown German glass eyes, real hair. Cotton batiste dress and hat, embellished with vintage silk flowers, lace and beaded with pearls. Cotton underskirt, pantalets, stocking, handmade leather shoes and a tulle handbag. 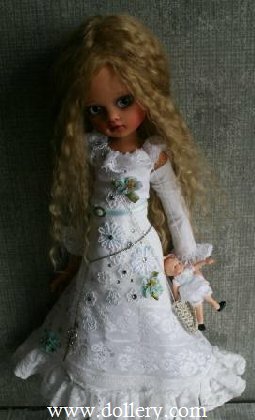 She carries an adorable porcelain one of a kind baby doll dressed in a christening gown with a baby bottle. Resin ball jointed doll, double jointed,18 points of articulations. Mouth blown German glass eyes, real hair. “Do not rob the little violet of its scent nor the daisy of its simple charm. If every tiny flower wanted to be a rose, spring would lose its loveliness.” St. Therese of Lisieux. She’s as sweet as sugar with a lot of spice, free to be who she wants to be. Amber Moon wears a knit dress with a removable tulle tutu, arm warmers, above the knee cotton stockings with high top laced boots. Her hat is embellished with a removable clip that can also be worn in her hair. She carries a fabric handbag ,by removing her tutu, her costume converts into an adorable mini dress. A necklace with crystals completes the outfit. The bike and lacquer box below are props and are not available for sale. Look for items around your house to use as unique props! See what you can come up with. Be Creative!! "Summer" - brand new! New Sculpt. 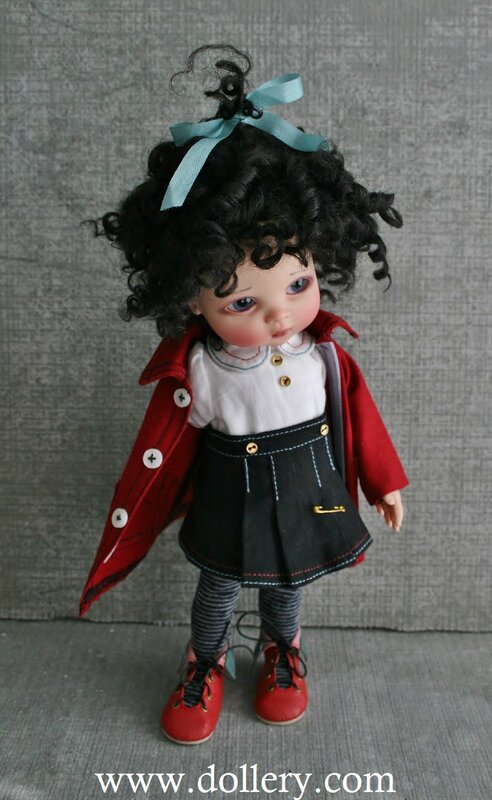 This particular doll with this outfit, hair, eye, and general "theme" is ltd. to just 50 worldwide. 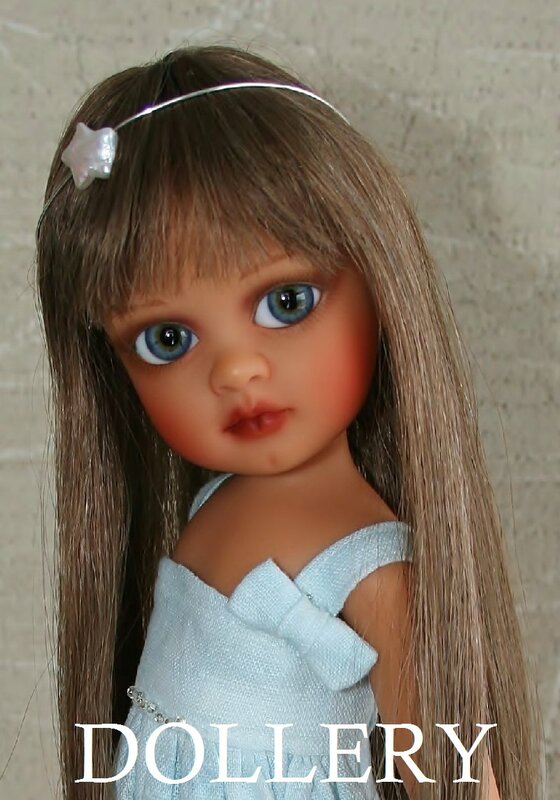 Email kmalone@dollery.com asap to get your beautiful "Summer"
Resin, double jointed ball jointed doll, 13 1/2" (34cm), tan skin, Brunette human hair, Mouth blown German glass eyes. “Summer ” was inspired by this beautiful quote by Anne Morrow Lindbergh: “One cannot collect all the beautiful shells on the beach. One can collect a few, and they are more beautiful if they are a few." “Summer ” Doll is self standing, but a stand is recommended. She wears a fine quality linen retro styled sun dress, hand dyed and distressed by the artist and embellished with small glass beads at the waist, leggings and on her leatherette flats. She carries a linen beach bag. Her hair is styled straight; a silver wire hair band with a cultured mother of pearl star completes the outfit. Ready to enjoy a warm summer’s day, accompanied by her tag-along puppy, Comet, from the “ Lorikins” collection. He is a jointed resin, hand painted by the artist. Comet is not included with the doll ,but can be purchased separately for $110. Summer: The beauty of a child, plain and simple, sweet and innocent. The shells, bowl and sand are not included. The "Lorikin" next to her is sold separately (see above).
" Comet" (puppy), "Kismet" (Kitten) and how cute is "Truffles" the piglet? Lorella sculpted these to accompany the new dolls, small enough to all fit in her palm , perfect size for her dolls to hold. They will be available in resin ,each one individually painted by Lorella. 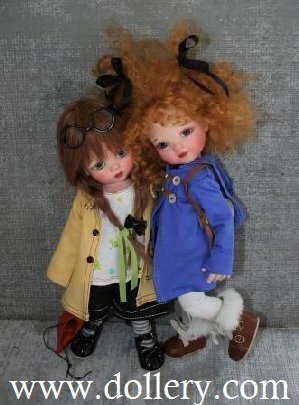 $110 each with order of doll. 2013 SHOW OOAK costumed and themed dolls created by Lorella just for our 2013 doll show. "Katalia" - Ltd. Sculpt of "Violet Skye" head, one of a kind costuming and theme. Only one made with the tan skin. Email kmalone@dollery.com - SOLD - NOTE, WE ARE GETTING ONE MORE NOT SHOWN HERE IN A COUPLE OF WEEKS. 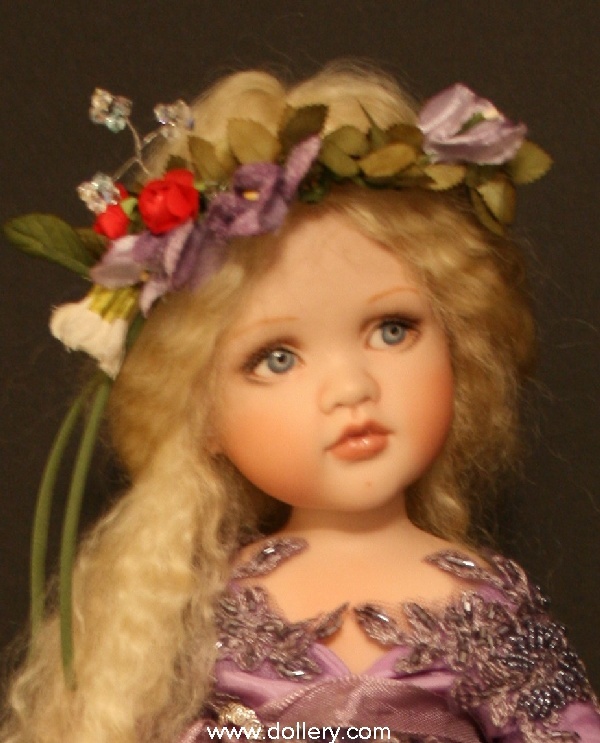 She will not have the tan skin but will be a ooak Violet Skye which can be pre-reserved. The doll below is available now. Resin Bjd ,Violet Skye sculpt. Mouth blown German glass eyes ,black human hair. Hand made leather boots, leggings. Super sweet hat, embellished with vintage flowers, netting and pearl beads. Velvet belt with chatelaine. Face up and costuming entirely done by the artist, Lorella Falconi. 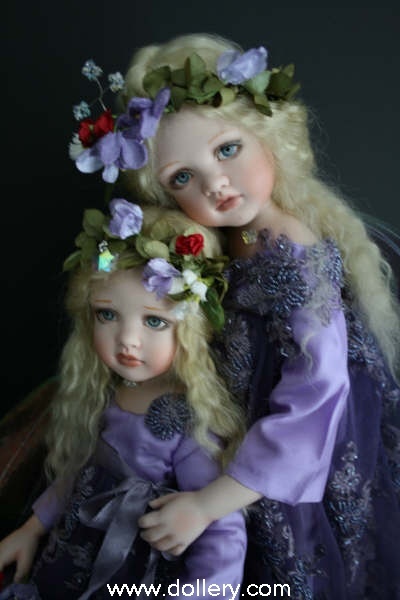 2013 Dolls - Brand new resin BJD's now available! Email kmalone@dollery.com asap as they will sell out quickly! 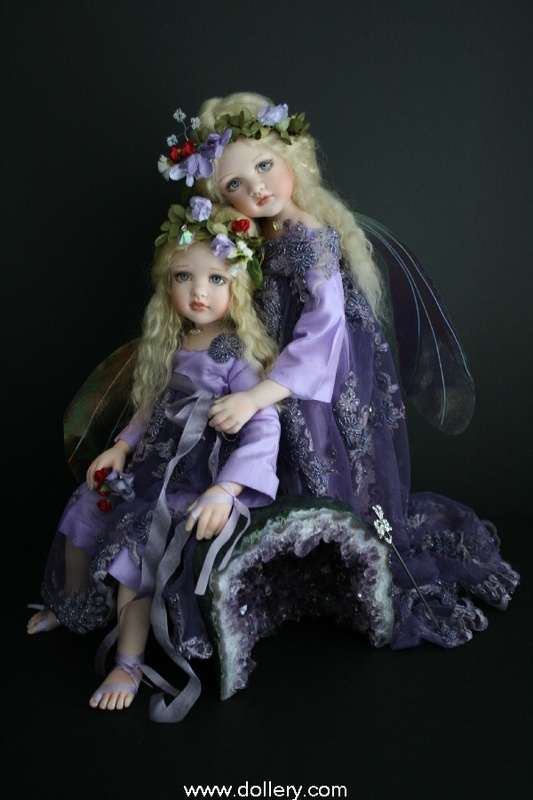 These are original sculpts by Lorella produced in a small edition of 150 in a resin BJD. The size 7/8 wigs can come off but the eyes do not. Resin Ball Jointed doll , painted and costumed entirely by the artist. Glass eyes , real hair, body has been blushed. Cosette wears a linen distressed dress , cotton batiste undergarments ,a linen hat and arm warmers. 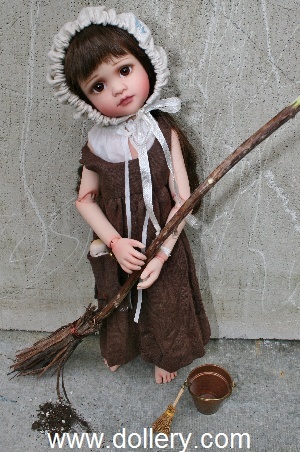 She carries her little porcelain dolly in her pocket and holds a handmade broom. Copper pail and brush included. Please order quickly as Lorella allocated small numbers to each store. Real hair - Two piece ensemble undergarments, stockings with garters. Crocheted angora purse with a crown pendant and chain strap. Patent leather platform shoes - She carries her favorite dolly "Kisses"
Resin, approx. 3" - Dressed in vintage laces and ribbons ,each one will be a OOAK. 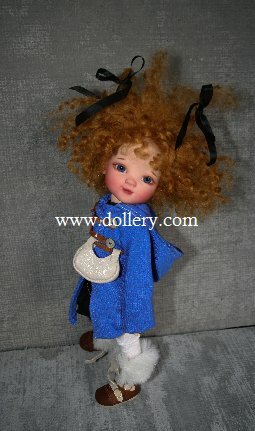 Little dolly is separately priced at $100.00 if you want to purchase thru the Dollery. We offer these as a service and make no profit on them. 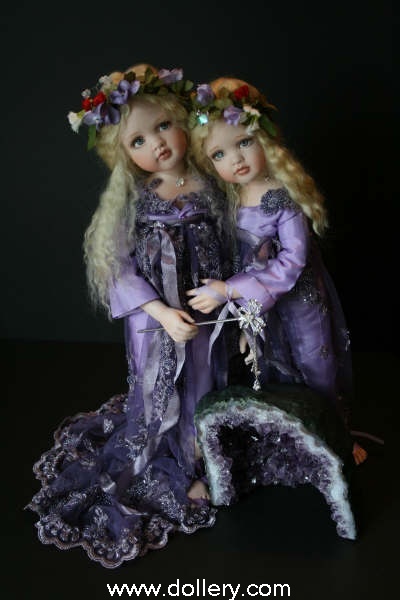 The little dollies are made in resin and hand painted by Lorella and clothed by Lorella herself. Solace is approx.. 13 1/2 "resin ball jointed. Green German mouth blown glass eyes. Patent leather platform shoes, leatherette pack, headband. 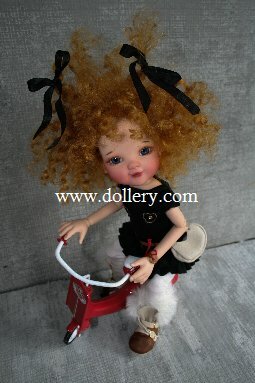 Little dolly is separately priced at $100.00 if you want to purchase thru the Dollery. We offer these as a service and make no profit on them. The little dollies are made of resin and Lorella is painting and clothing them herself. Valentina Rose II, Don't Stop Believing! 13.5" resin ball jointed doll, double -jointed. 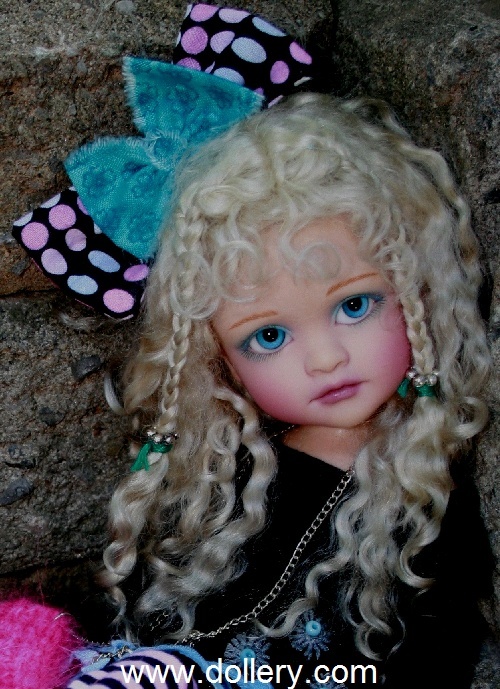 Glass eyes, mohair wig with braids and beads. Striped leggings and matching hat. The bow hair clip can be removed and used on her hair or on her hat. Angora handbag with chain strap, embellished with stars. Charm bracelet. She has on adorable black and aqua leatherette "Shoebooties" collar down shoes, collar up boots, "shoebooties" as Lorella likes to call them, designed by Lorella. Also pictured is Little Brother. He is a separate purchase. We are still awaiting the price on him from Lorella. 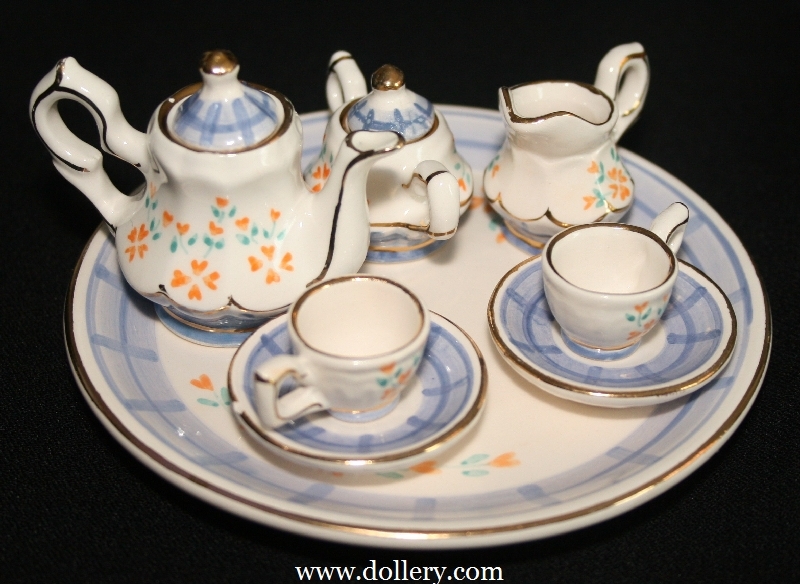 Four porcelain one-of-a-kinds shown below. All were from orders put it a long time ago. Lorella (busy, busy lady) finally had some spare time to work on them and look at the results! Adorbs. Email kmalone@dollery.com to be put on the Waiting List in case Lorella ever does more! Lorella hand knit each shawl and little purse herself. Her dress is made of silk from Germany. She has German glass eyes and long blond human hair. Lorella hand finishes the embellishments, trims and seams. She also assembles the eyes, wigs, costumes and all the details. Lorella has designed everything! "Valentina Rose" - New! 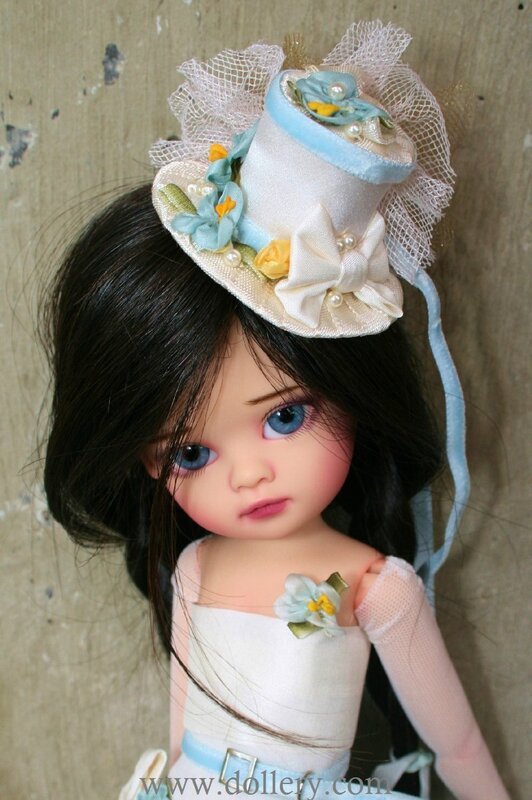 Okay, the Valentina Rose I is sold out - SORRY- BUT.... You can put in your reservation order for the 2nd Valentina Rose - Lorella has finished the prototype of her 2nd outfit, wig, etc... and she said she is ADORABLE! She will have the same "funky" feel to her. We are taking reservation orders for her now with final approval being made by customer once the final photos is presented. Don't wait... she is a winner, sold out to dealers already. More details- She is a resin BJD produced in an edition of 150 of the head and just 50 as shown below of the outfit and style. She comes with her red pocket book but it will be faux leather not real leather. The tiny doll does not come with her; however we will have accessories from Laura including shoes, tights, dolls and bunnies etc... for sale seperately to add later in the year. 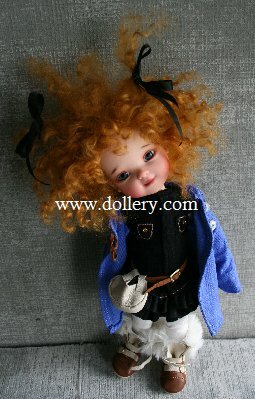 We are also now selling her little doll for $125.00 or $99.00 if you order the large doll! Hurry - Lorella makes them all on her own and she will only be able to make so many. Right now those accessories are all handmade by Lorella so they are quality and more expensive. She might have additional more mass produced accessories in the future. The head of the BJD opens at the top (small opening) - Lorella will insert the eyes and then wig it. A collector could change eyes if they wanted to. These dolls have oval eyes. The wig is attached with velcro and can be removed. 14", LE/150 of head, 50 in this costume and then 50 in another outfit and 50 in another one. 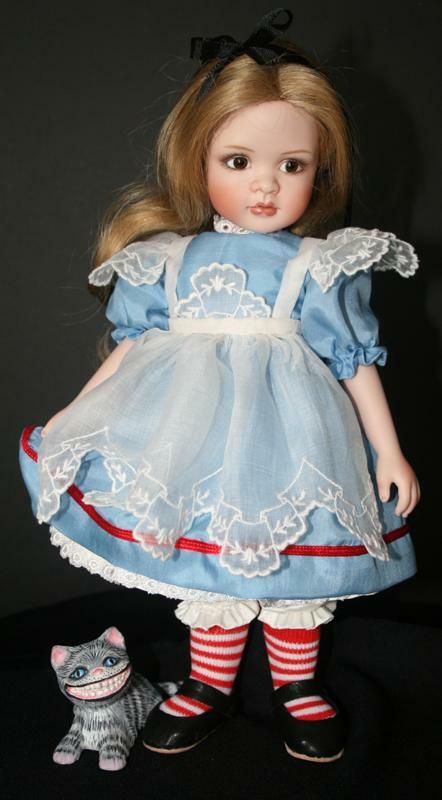 Iris Blue, $1,700.00 (with the accessories shown)- Sold thru another dealer but Lorella told us to post as very similar dolls can be special ordered with similar outfits or in different colors. Price would be $1,500.00 without accessories. Email kmalone@dollery.com for prices on accessories. 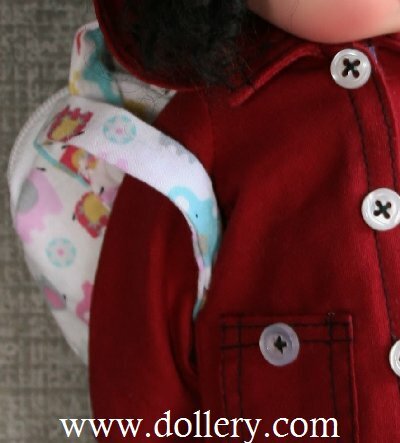 Custom orders will vary in pricing and different themes of one of a kind dolls are coming. REMEMBER, This doll has a cloth body with armature/ porcelain legs and arms and chest plate and head of course. Glass round eyes. It is NOT a bjd. 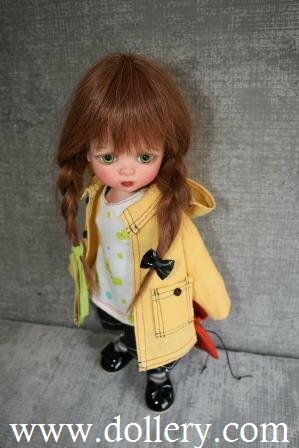 It is a jointed doll but you cannot remove the eyes or wig. Email now for more info. "Little Sister" - How cute is she? Adorable Valentina Rose's beloved dolly, named" Little Sister". 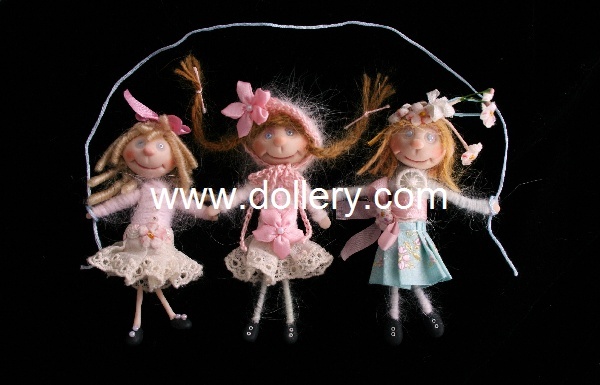 Each doll is handmade by Lorella . Made of polymer clay and dressed using angora yarns, vintage laces and silk ribbons, each one will be dressed differently and all are so unique. ORDER NOW - $125.00 EACH or if you purchase either "Solace" or "Valentina" get her for $99.00. Exact ship will be charged! I don't think it will be too expensive! LOL!!!! 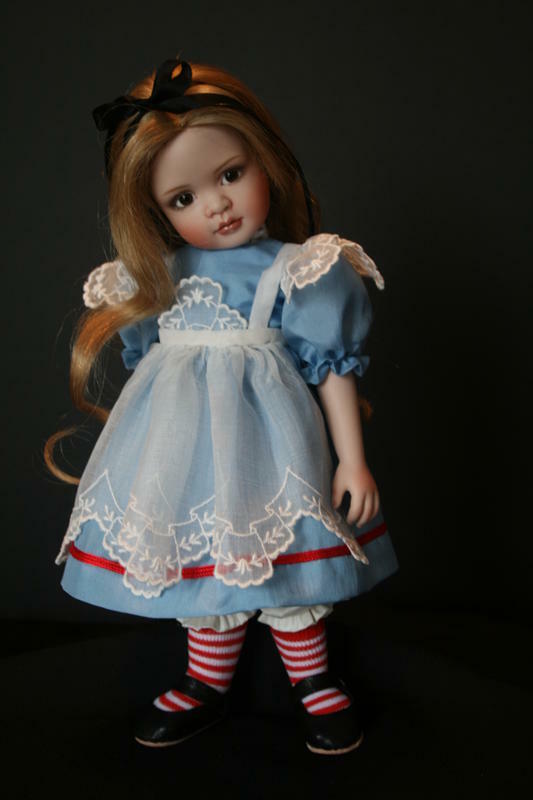 "Mia" - dressed as "Alice in Wonderland" Exclusive to the Dollery! The whole sculpt is Ltd. 50 (Sculpt) - but there will be a very limited number of her done in the Alice costuming exclusive to the Dollery. She is available for $990.00 w/o the cat. If you would like the adorable cat, chair and or a rabbit there will be an additional charge. Contact kmalone@dollery.com. 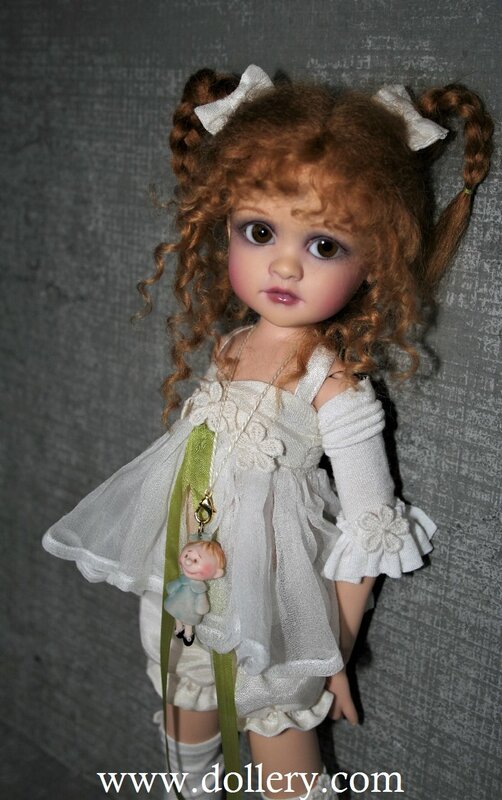 This is a beautiful porcelain ball jointed doll. We are taking orders now with a deposit of 25% down and the balance due when in. Extended layaway available. 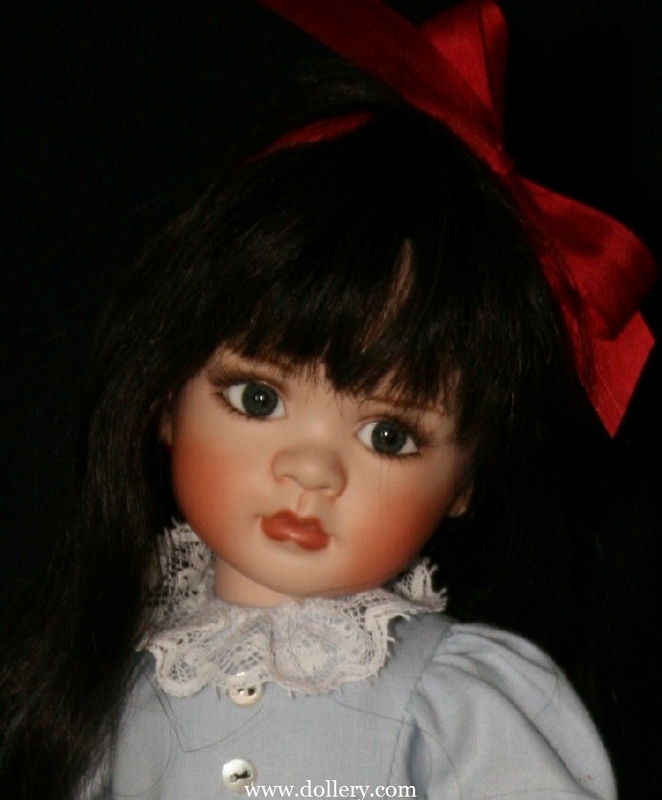 this doll is now available on our Secondary Market Page for sale. Porcelain BJD, approx 13", human hair, slate blue glass eyes. Light Blue cotton dress, trimmed with French cotton lace. Cotton underpants, French lace slip. Cotton striped stockings, handmade leather shoes. Wood stand. BJD porcelain,approx. 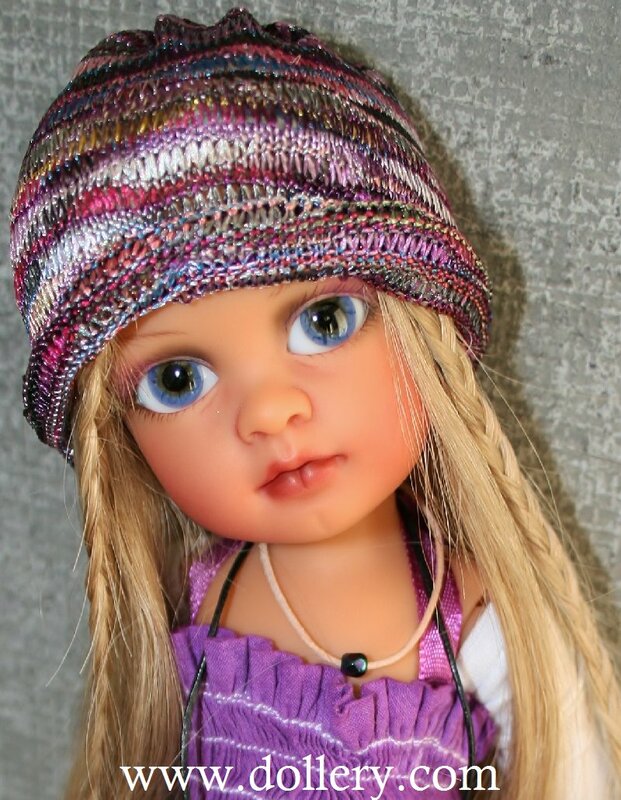 13", human hair wig, amber glass eyes, hand knit angora sweater and hat. Hat is embellished with mother of pearl flowers. Irish linen pants,pink silk crocheted socks, handmade leather shoes. She carries a small teddy bear. Wood stand. 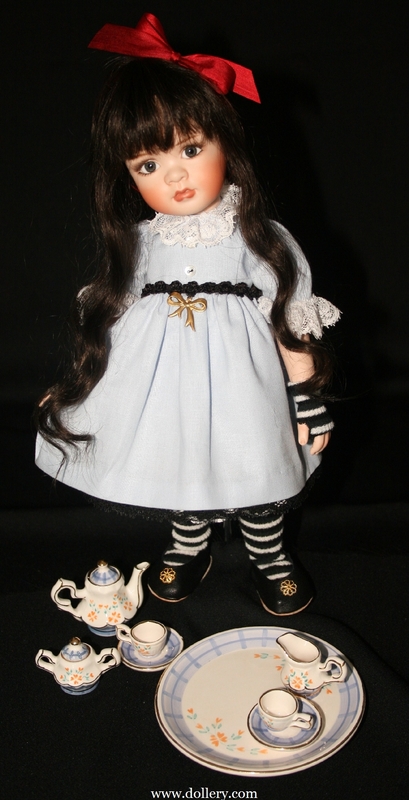 "Mia" - dressed as "Alice in Wonderland" Exclusive to the Dollery! The whole sculpt is Ltd. 50 (Sculpt) - but there will be a very limited number of her done in the Alice costuming exclusive to the Dollery. She is available for $990.00 w/o the cat. If you would like the adorable cat, chair and or a rabbit there will be an additional charge. Contact kmalone@dollery.com. 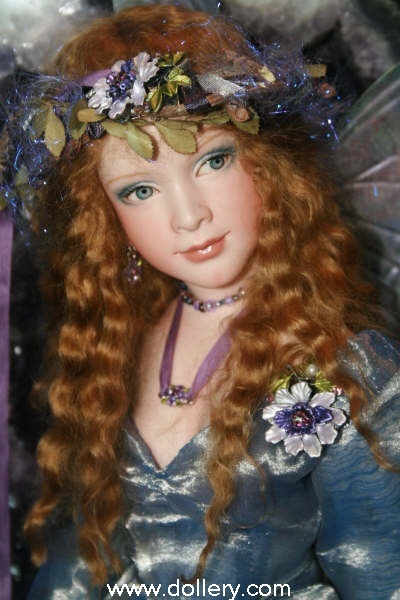 This is a beautiful porcelain ball jointed doll. We are taking orders now with a deposit of 25% down and the balance due when in. Extended layaway available. "Mia" - Ltd. 50 (Sculpt) - Ball Jointed Porcelain - $990.00 & Up (Price depends on the level of costuming.) Each doll will have one of a kind costuming. 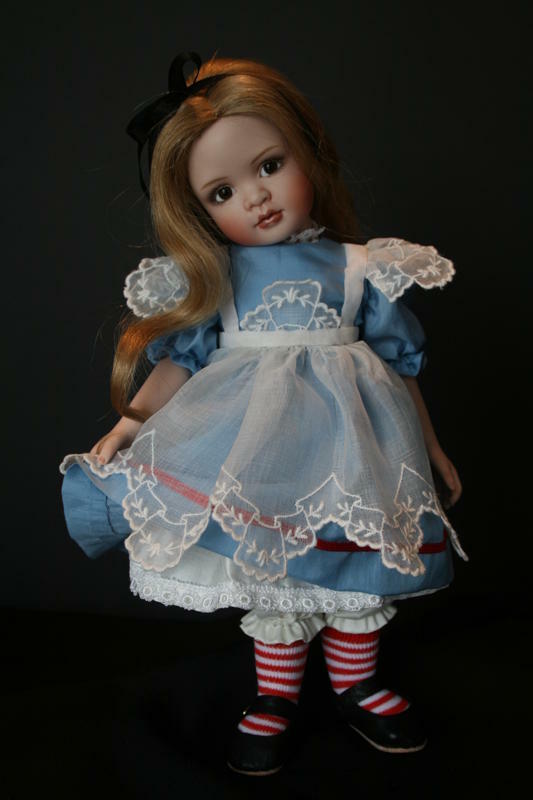 This particular doll is not available thru us but Lorella has given us the photo and we are taking orders for similar dolls dressed in one of a kind costuming and we have requested some more for our shop with more elaborate costuming. You may request a general "feel" or color for costuming and we can see if that is possible. We are taking custom orders now with 25% down, balance due when in. Note collector's will have to be open to Lorella's creative freedom to a certain extent. Keeping that in mind, she has always done a fabulous job for us and her "eye" is superb. You will be very pleased! Hurry, get them while they last....good price, great value and ball jointed porcelain! Wow! 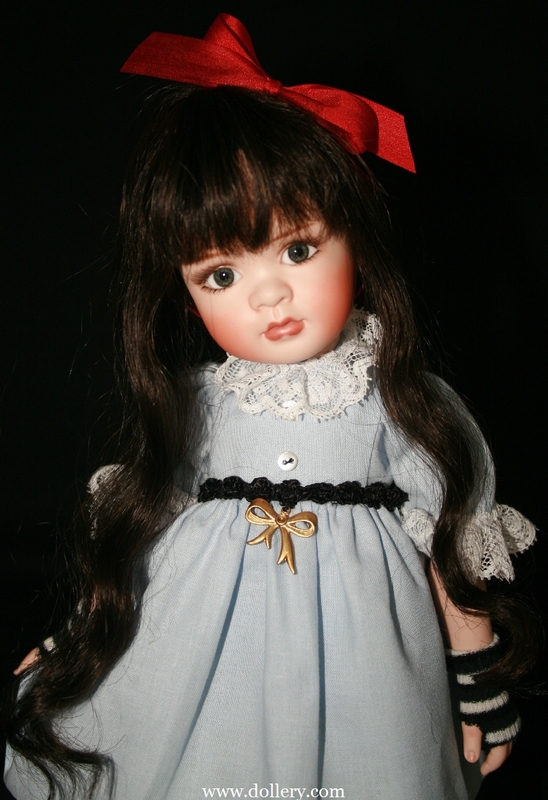 "Alessia" - Brand new Limited Edition Ball Jointed Porcelain dolls! 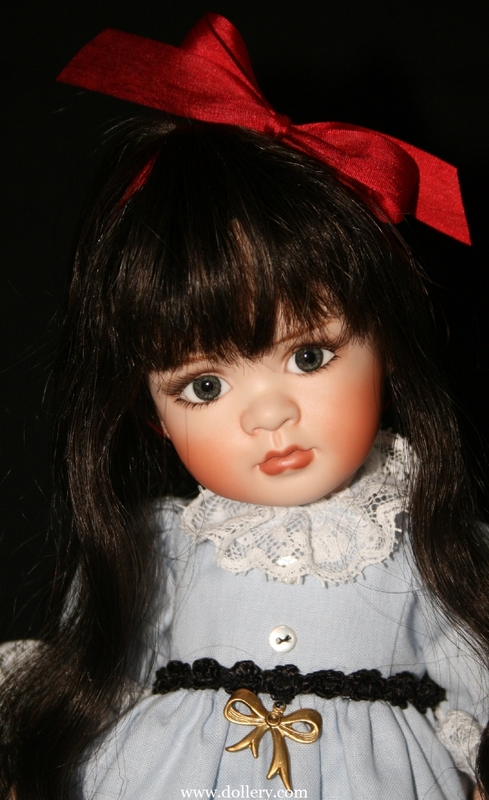 Ltd. 50 - $900.00 - 12", with glass eyes and human hair. 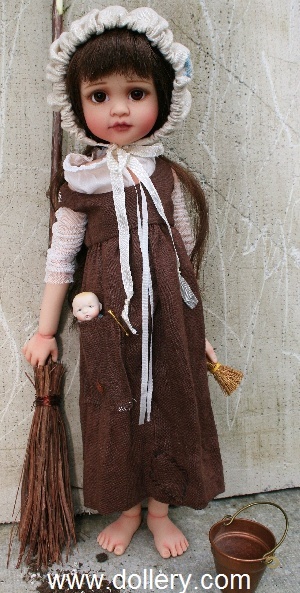 She wears an Irish linen dress with cropped pants, hand knit angora wool hat and scarf, handmade leather shoes and comes with a wood doll stand. She is limited to 50 and you have a choice of pink shoes hat and scarf instead of aqua shoes, white hat and scarf. Now with full body sculpted stomach! Comes w/Bird cage but not geode (unless requested) - Call or email kmalone@dollery.com. The flowers were all hand made by Lorella. Call or email for more details. 17", hand painted violet eyes, angora wig. "Angora Series" - Ooak - New for 2009 - Kiara - human hair - SOLD - Call and inquire on other dolls similar or possible custom orders. 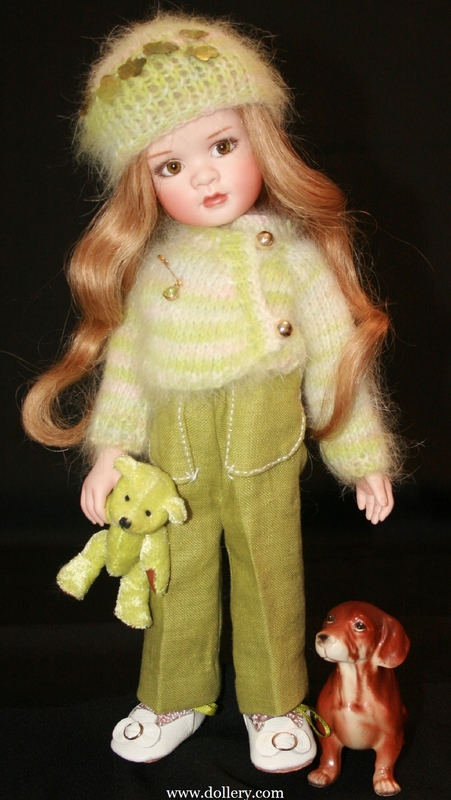 Lorella Falconi came from Canada to be a part of our 26th Doll Show! EACH ONE IS A ONE OF A KIND SO NO TWO CAN BE EXACTLY ALIKE. 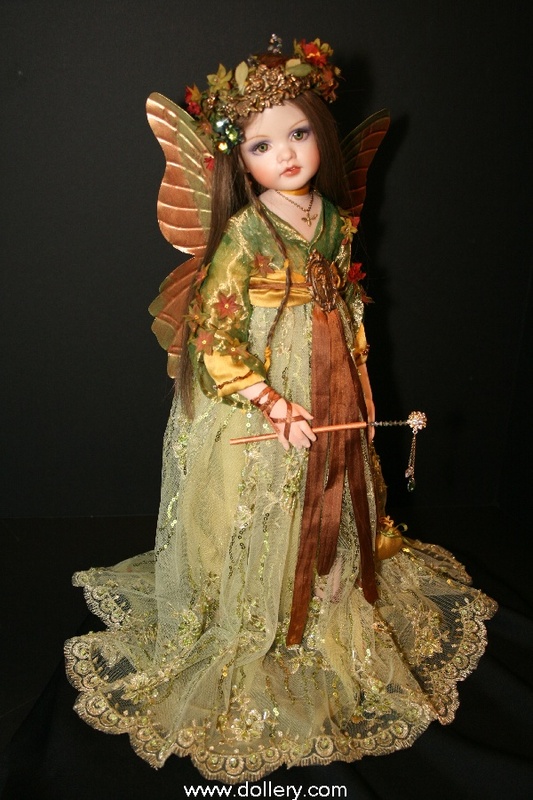 Lyric, Show Priced at $2,600.00 SOLD - this doll is now available on our Secondary Market Page for sale. One of a Kind, porcelain head, shoulder plate, and limbs, approx 16". 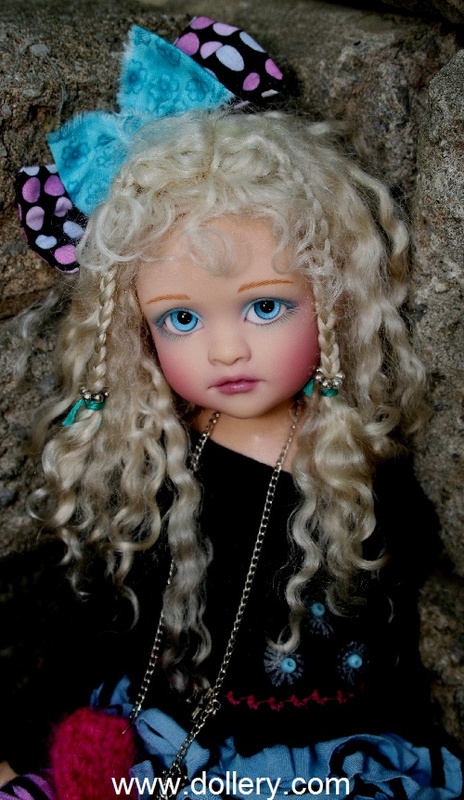 Aqua painted eyes with a very soulful expression, pale blonde handmade angora wig, soft body, totally posable. 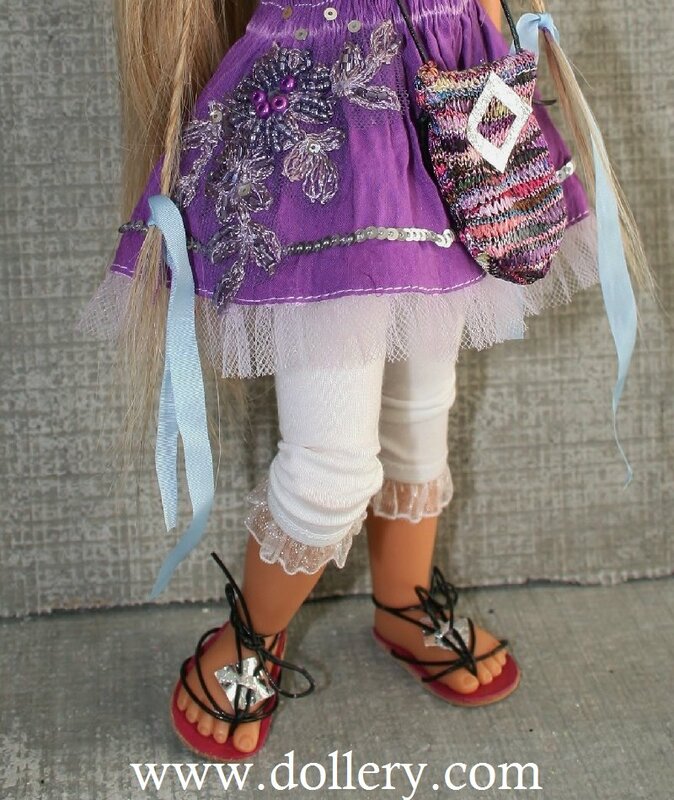 Doll wears a two piece lavender beaded dress and pantalets. 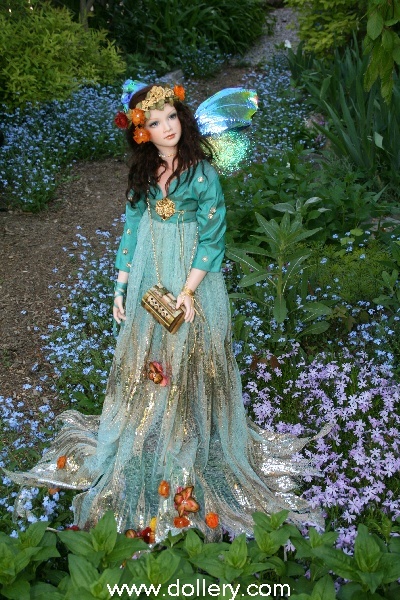 She carries a silver crocheted satchel, her crown is adorned with leaves, flowers and an aurora borealis butterfly. Her wings are made of film and wire and can be positioned in and upward or downward position. Her wings are positioned downward to reflect her mood of needing reassurance. One of a Kind, porcelain head, shoulder plate and limbs, approx.17". 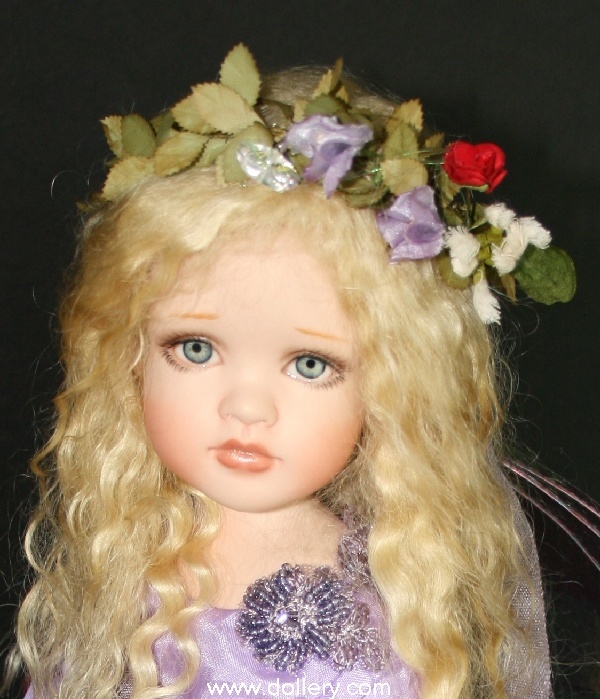 Blue painted eyes with a loving expression, pale blonde handmade angora wig, soft body with armature, totally posable. 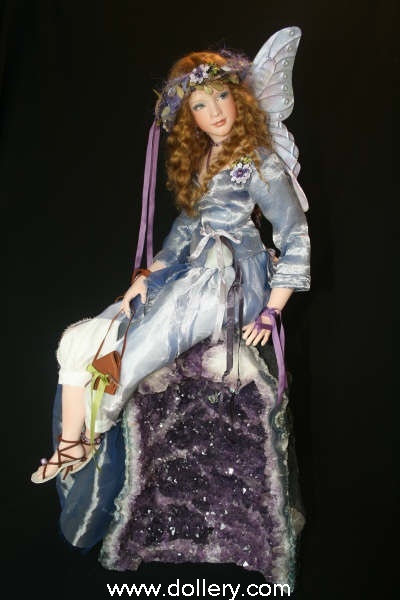 Doll wears a two piece lavender ensemble, beaded glass and embroidered long dress with pantalets, she carries a silver staff with aurora borealis crystals. 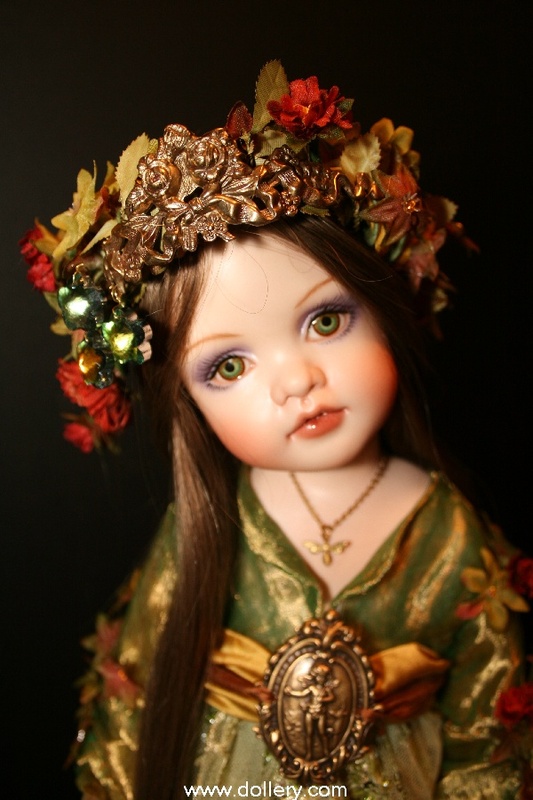 Her head is adorned with a crown made of leaves, flowers and Swarovski crystals. Her wings are detachable and are made of film and wire, they can be positioned in an upward or downward position. The doll can sit or stand. She sits on an Amethyst geode. 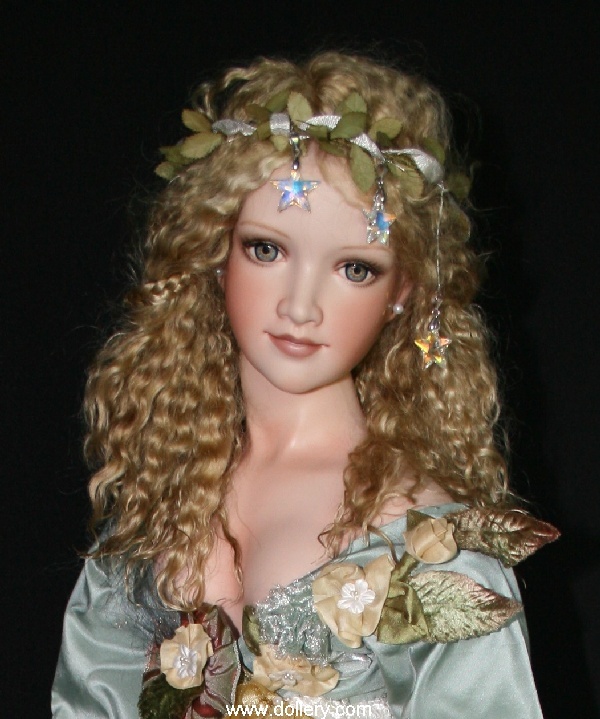 Goddess of the Meadows, One of a Kind, Porcelain with soft body and armature. 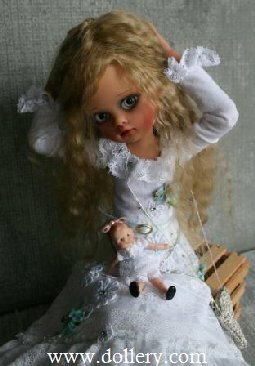 Fully Poseable, painted eyes, blond Handmade angora mohair wig. 32" if standing. Her golden hair is adorned with crystal stars that capture the moonlight. Those who are lured by the sound of her flute need only follow the dancing stars that lead to the meadows. She wears a gown of silk taffeta, embroidered French silk with pearls and glass beads. She has silk metallic undergarments. Her dress is embellished with handmade silk flowers and leaves. She holds a handmade flute and custom made marble pedestal. Porcelain, One of a Kind, porcelain limbs, soft body armature, fully poseable, painted eyes, handmade angora wig. 27" (if doll was standing) 35" seated with Geode. 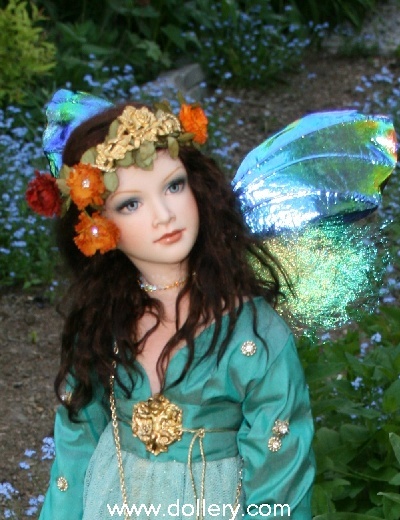 The Azzurra blued eyed fairy wears garments made of metallic silk embellished with cloisonné enamel flowers, ribbons and rayon pantalets. Garments are lined and French seamed. She has handmade leather sandals. Her head is adorned with a crown made of vine and a cloisonné rose. Her jewelry is also made of cloisonné. She has handmade metallic wings. 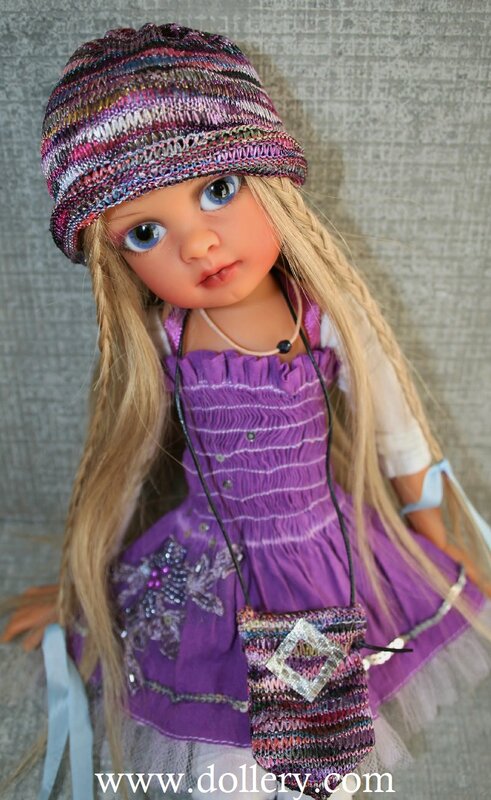 Azzurra comes complete with her silk satchel with fairy dust and her gorgeous amethyst quartz pedestal. It is 17" and weighs about 30 pounds. It also has white quartz and agate in it. Lorella added some aurora borealis butterfly crystals in the center. Azzurra is enchanting and may just put a good spell on you.